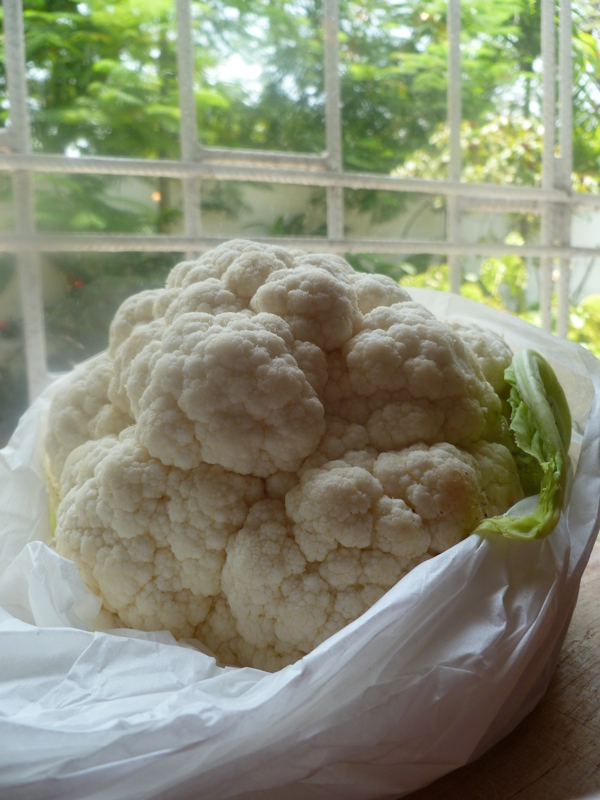 Italian, Indian and Chinese cooks find common ground on the issue of what to do with a cauliflower. They will differ over the particulars, but all agree that taking the vegetable apart and mixing it in a pan with other flavours is a good idea. The particular version of the good idea described here is distinctive, assertive, and good-tasting. 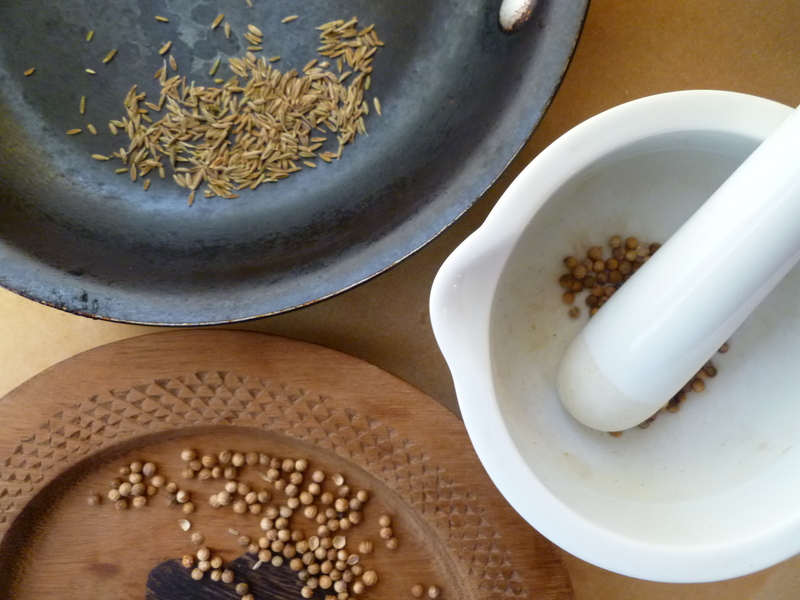 This brief and busy little recipe is full of activity: toasting, grinding, chopping, mixing…and devoid of complexity. If it were a song, it would be a ‘ditty’, for it is whimsical (of no one particular style or cuisine); it is simple; and it makes for a diverting good time…in the kitchen. 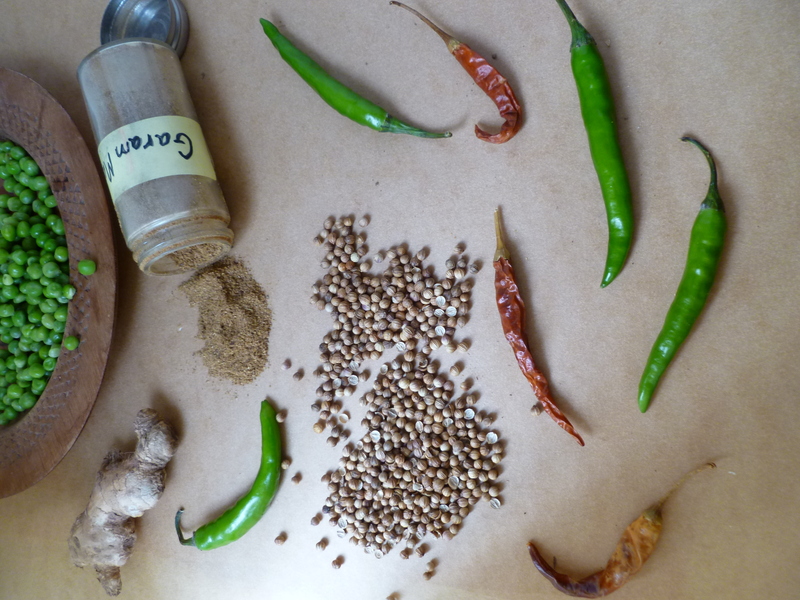 1/2 teaspoon of garam masala: the photographed recipe is made from a packaged garam masala spice blend. 2. Heat the oil in the wok. Add the whole dried chile(s), and the ground coriander and cumin seeds. Cook, stirring, for a couple of minutes, then add the minced fresh green chile and fresh ginger and cook for a minute more–still stirring . 3. 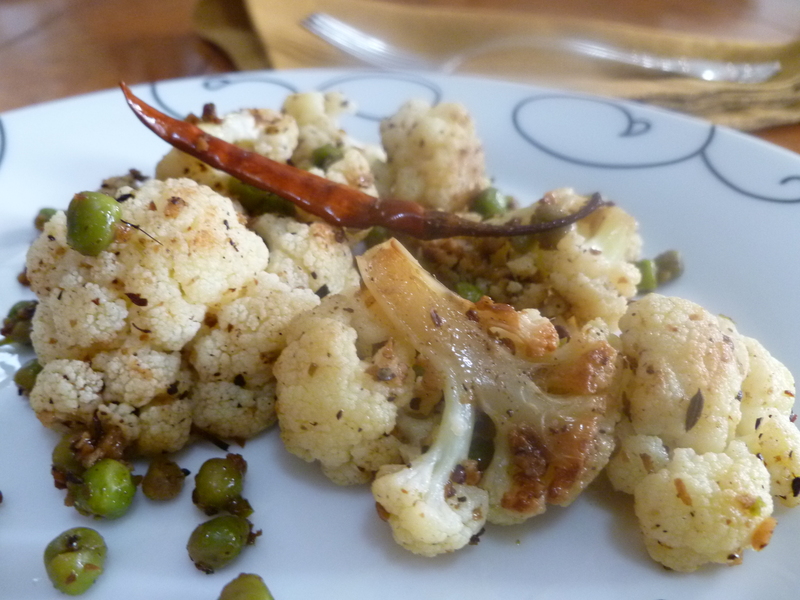 Add the cauliflower and stir-fry it, coating it with the spices, until it begins to brown–for about 3 – 5 minutes. 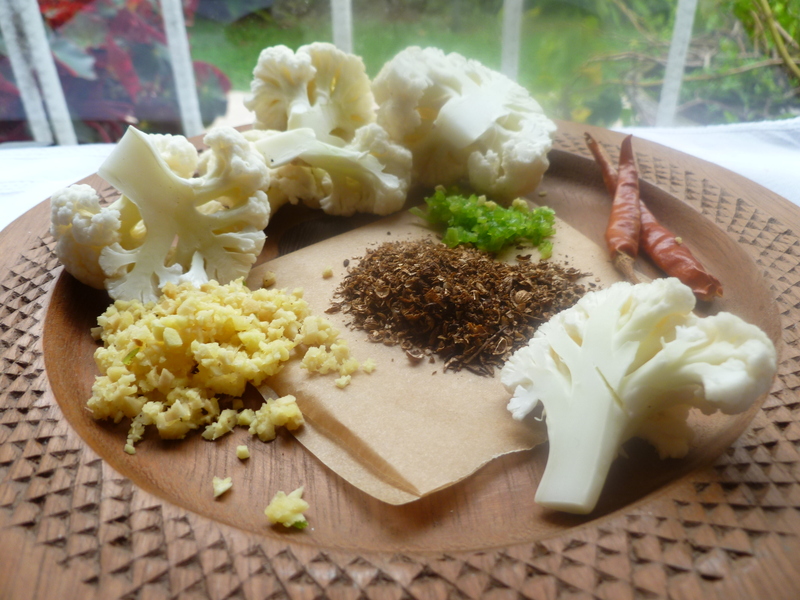 Add 1/4 cup of water, cover, and cook until the cauliflower just becomes tender–perhaps another 4 – 5 minutes. Remove the lid, add the peas and increase the heat to high. Add the garam masala and stir-fry the vegetables for a minute or two more, until the water is evaporated and the peas are heated and just cooked. 4. Add the kosher salt (more or less than the suggested amount of 1/2 teaspoon). 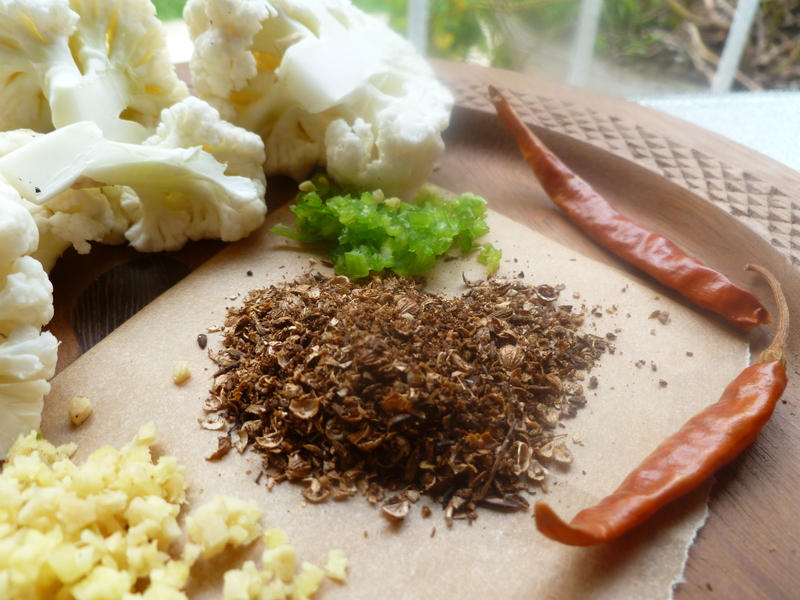 Garnish each serving with a small, stemmed, whole dried chile de árbol pepper, if you like the idea. 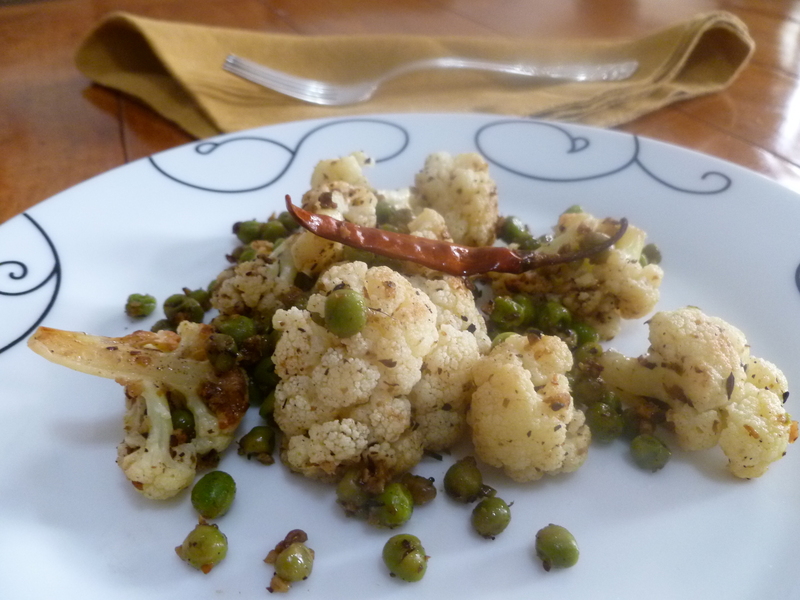 A Note: Stir-fried Cauliflower and Green Peas with Toasted Cumin and Coriander Seed accompanies the Main Course of the Lunch Menu: Lunch from the Grill in the Congo. 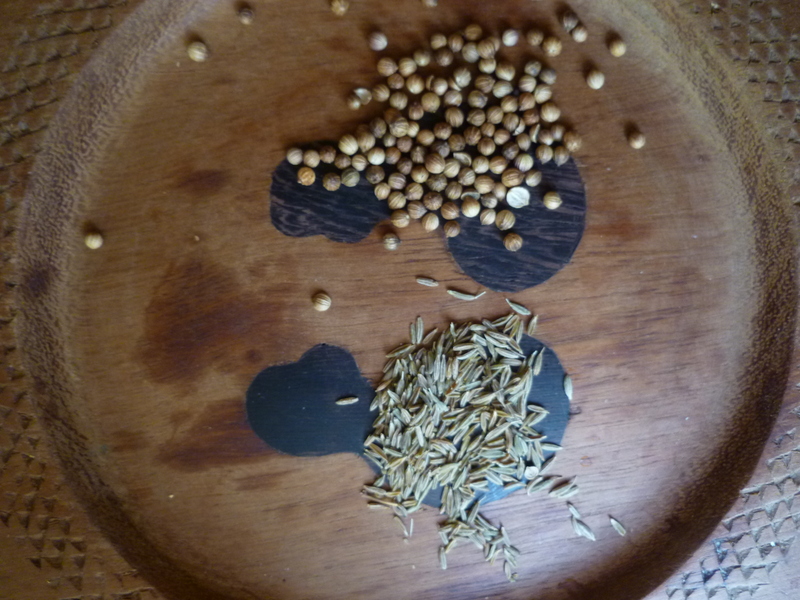 The citrus-ey flavour of the coriander seed goes well with fish.